This tank wagon was formerly owned by Esso Petroleum Co. Ltd., who donated to the QRS in 1982. 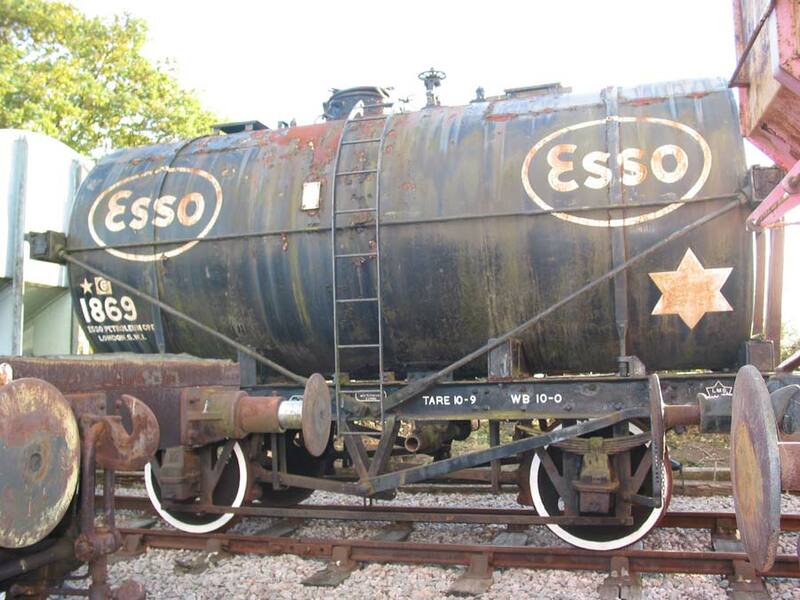 This ex-Esso tank car, dating from 1939, is one of a large number built for the Air Ministry just before the second world war, and operated by the wartime Petroleum Board. These standard 14-ton, saddle-mounted, Class-A wagons on a 10-foot wheelbase, were required for the carriage of aviation fuel from the west-coast ports to the east of the country, where fuel dumps were forbidden in case of invasion, but where most airfields were situated. 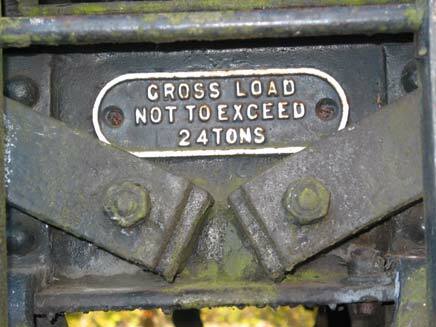 They were built by a variety of manufacturers, and this one carries no makers' plates, however the wheels are stamped 'Scottish Steel Coy 1939', and it was in fact one of a batch of 25 (AM276-300) built by R. Y. Pickering in May/June 1939 and registered by the LMS as Nos. 165334-58. No. 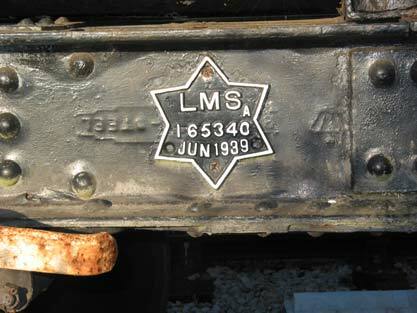 1869 (as AM282) was inspected in June 1939 and registered for fast traffic by the LMS, being given the number 165340. Perhaps the journey from the builders counted as the mandatory 100-mile running-in distance required for fast traffic registration. 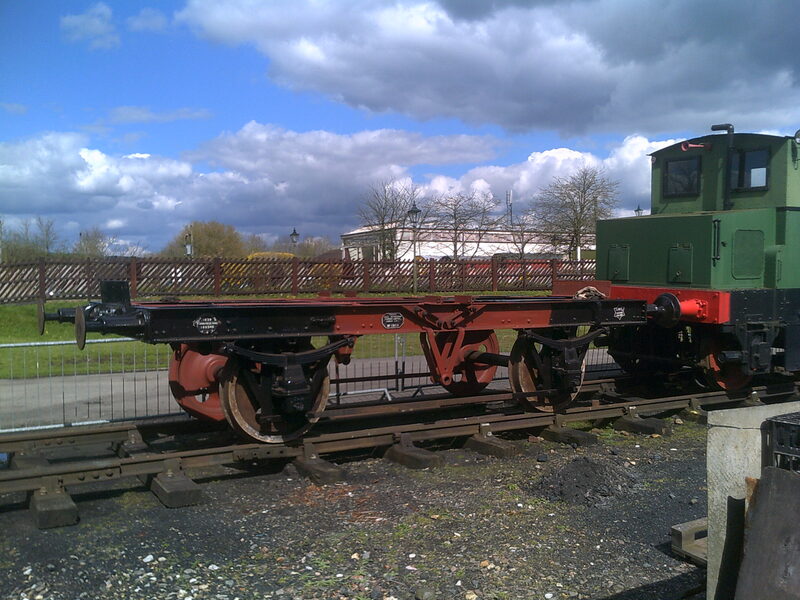 As with all Class A tankers this vehicle is fitted with top discharge siphon and vent, but it has also been fitted with bottom discharge equipment, the control wheel for which is necessarily outside the 16 inch filler port introduced in tankers from 1927. The tank is welded, and the ESSO logo is an early pattern, in which the tails of the E and S are cut at right angles to the line instead of vertically, indicating that the tank was painted before 1966. 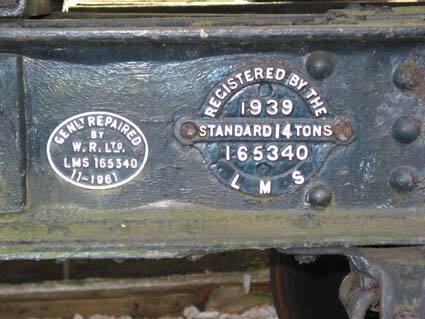 This is supported by the repair plate, which shows that the vehicle was given a general repair in November 1961 by Wagon Repairs of Wellingborough Northants, and all four oil-filled axleboxes are marked with the initials of that company. After the war the decline in the need for aviation spirit reduced the need for Class A tankers. 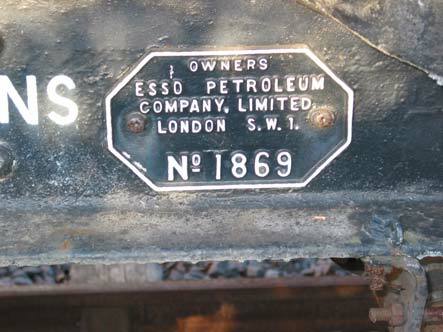 Esso purchased a large number and converted them to Class B for fuel oil carriage, among them No. 282 - renumbered in the Esso series as 1869 - which explains why both top and bottom discharge fittings are mounted. Part of this modification was to fit steam heater pipes and coils and to lag the tank with cork. This enabled the contents to be raised to 150°C in under two days, and to maintain the temperature above 70°C for four days. The connections for this are still to be found on one end of the tank. 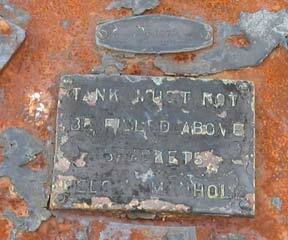 Affixed to the filler port is a metal label giving details of capacity - 4070 gallons, permitted ullage and its Air Ministry fleet number, 282. 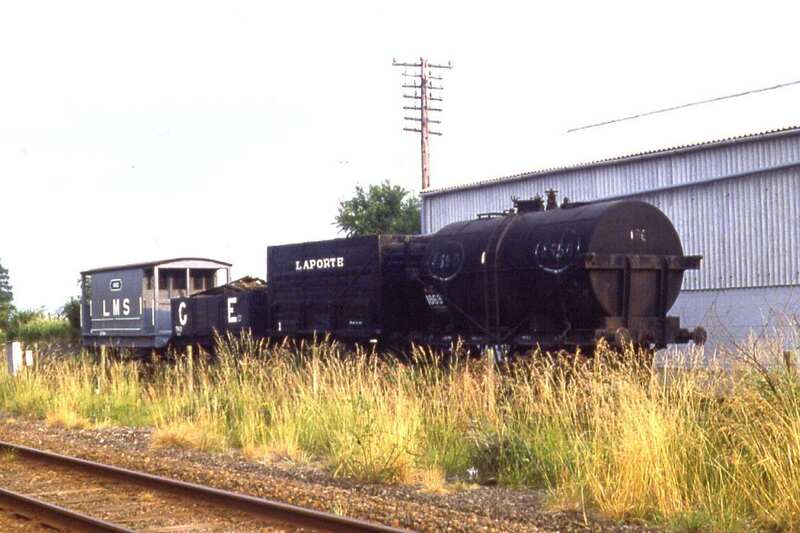 Traceable paint samples indicate that the wagon had red solebars and saddles, and an ochre tank with some red, this presumably being the remains of the red band once compulsory on Class A tankers, and which was discontinued during the war. Type :- Heavy Oil Builder :- LMS / R Y Pickering Wheelbase :- 10' 0"